I walked in and sat down as the sign near the door instructed. The dining room was interesting with the grill in the middle and tables branching out from it connected by interior paths that separate the servers’ area from the patrons’ area. The menu is on the wall and I couldn’t see it from my booth without getting up and walking over to it. I am guessing that most people either just come for the burger or have been there enough times to memorize it so no one really needs it. Overall the dining room is dated but in a charming way that takes you back in time. 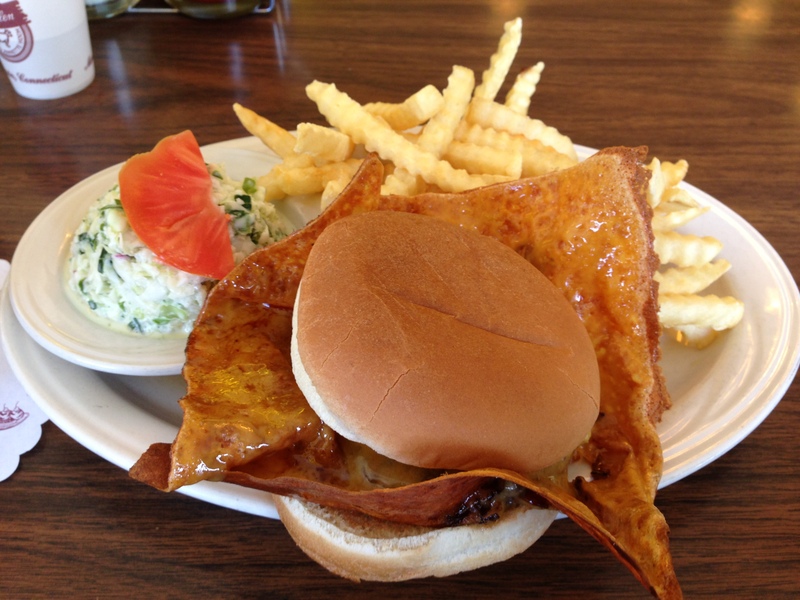 The cheeseburger is what Shady Glen is famous for. They use four slices of cheese but only put the corner of each slice on the patty. This means that ¾ of each slice is sitting directly on the grill where it crisps up and makes a burger with wings. Does this make a better burger? No, not at all. Frankly I don’t think it tastes that good and I didn’t think the meat they used in the patty was memorable. It is certainly unique and I am glad I tried it, but I don’t have any urge to return. Along with the burger were fries and coleslaw. The fries were worse than the burger. They weren’t very crisp and were heavily under-salted. I don’t believe there is any amount of salt you can add to fries once they come to the table that will compete with straight-out-of-the-fryer salting. The coleslaw, on the other hand, was wonderful. If I go back, I will make sure to get some. It had a great balance of vinegar and mayo making it both tangy and creamy. Also good was the thick and creamy Oreo milkshake, but that is pretty hard to mess up. Shady Glen is an experience worth having. I am sure if you grew up on it you would fall in love the place. For newcomers, it’s not much more than a strange burger and a good shake in a classic spot, but that’s not bad. I’d like to eat that cheese as a snack. I thought so too but it really isn’t as good as it seems. The cheese looks burnt! not appealing to me! It’s not really burnt, but it’s flavorless. Some people really love it, but I’m with you, just not appealing. If that was standard American cheese – big mistake: it doesn’t fry/crisp very well. And the fries don’t look done. Did the other food being served look like it merited the James Beard “American Classic” designation? Is that just a “locals like it” award? You are spot on with the cheese and fries. Like I said the coleslaw and shake were good and I have learned since that the minestrone is very good, but nothing that would earn a food award. It seems to be an award given more to “historical” local restaurants than places with great food. In Boston we have two places that have earned the award and neither of them are spectacular. Still worth a visit from a food culture perspective, but not for the food. This may be off topic, but the whole burnt cheese thing reminded me of it…There is a pizza place in Chicago called Pequods Pizza that makes amazing pan pizza, and they line the pan with cheese so that you end up with a caramelized/burnt cheese crust. If you’re ever in the area you should check it out! Thanks. I used to live in Chicago but I don’t know that one. Sounds good. I’ll try it the next time I’m back! I have nothing against cheese in fact this buyer was one of the few times in my life I didn’t like cheese.